For over a thousand years St. Cecilia has been one of the most venerated martyrs of the early Church; she is among the seven martyrs named in the Canon of the Mass. According to a tradition current at the end of the fifth century, Cecilia was a Roman girl of patrician family, who had been brought up as a Christian. She fasted often, and wore a coarse garment beneath her rich clothing. Although she wished to remain a virgin, her father betrothed her to a young pagan named Valerian. When the wedding day came, Cecilia sat apart from the guests, repeating psalms and praying. After the ceremony, when the guests had departed and she was alone with her husband, Cecilia made known her great desire to remain as she was, saying that she already had a lover, an angel of God, who was very jealous. Valerian, shaken by suspicion, fear, and anger, said to her: "Show me this angel. If he is of God, I shall refrain, as you wish, but if he is a human lover, you both must die." Cecilia answered: "If you believe in the one true and living God and receive the water of baptism, then you shall see the angel." Valerian assented, and following his wife's directions sought out a bishop named Urban, who was in hiding among the tombs of the martyrs, for this was a time of persecutions. Valerian made his profession of faith and the bishop baptized him. When the young husband returned, he found an angel with flaming wings standing beside Cecilia. The angel placed chaplets of roses and lilies on their heads. The brother of Valerian, Tiburtius, was also converted; and after being baptized he too experienced many marvels. Valerian and Tiburtius devoted themselves to good works in behalf of the Christian community, and they made it their special duty to give proper burial to those Christians who were put to death by order of the prefect Almachius. The two brothers were themselves soon sentenced for refusing to sacrifice to Jupiter. Maximus, a Roman officer charged with their execution, was converted by a vision that came to him in the hour of their death. After professing Christianity, he too suffered martyrdom. The three were buried by the grieving Cecilia, and a little later she herself was sentenced. The prefect came and tried to reason with her, but when he found her firm in the faith and scornful of his threats, he gave an order that she was to be suffocated in her own bathroom. Surviving this attempt on her life, a soldier was sent to behead her. He struck at her neck three times, then left her lying, still alive, for it was against the law to strike a fourth time. She lingered on for three days, during which the Christians who remained in Rome flocked to her house. In dying she bequeathed all her goods to the poor, and her house to the bishop for a Christian place of worship. She was buried in the crypt of the Caecilii at the catacomb of St. Callistus. The above legend of St. Cecilia dates back, as we have said, to the end of the fifth century. There is no mention of this saint in the Depositio Martyrum, but there is a record of an early Roman Christian church founded by a lady of this name. In the ninth century Pope Paschal I moved the remains of many martyrs from the catacombs to new churches within the city; the presumed relics of St. Cecilia, her husband, his brother, and the Roman officer Maximus, were all placed in the church of St. Cecilia. 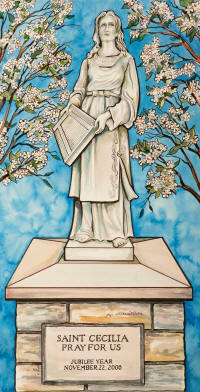 The origin of her veneration as a patron of music is unknown to us. She was not associated with music in the early period or in the account given in the medieval Golden Legend by Jacobus Voragine, but artists of later times have delighted in depicting her at the organ, singing God's praise or listening to a choir of angels. This was taken from "Lives of Saints", Published by John J. Crawley & Co., Inc.